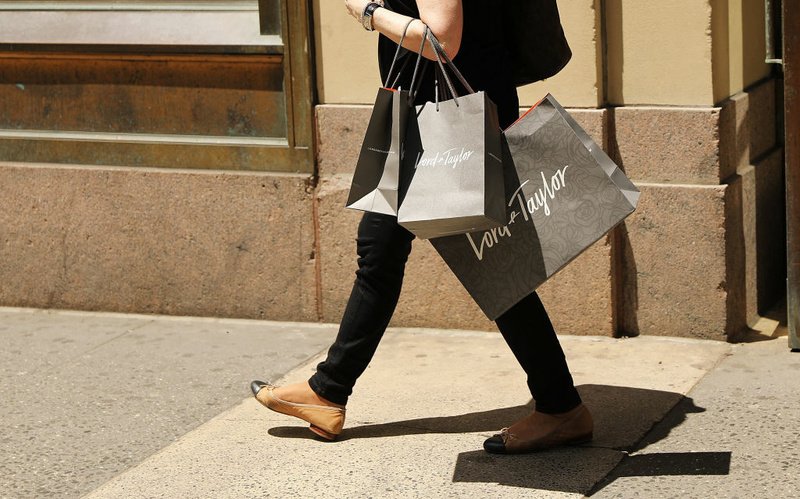 NEW YORK, NY - JUNE 06: A woman walks out of Lord & Taylor's flagship store on 5th Avenue in Manhattan on June 6, 2018 in New York City. The U.S. economy surged in the April-June quarter to an annual growth rate of 4.1 percent. That’s the fastest pace since 2014, driven by consumers who began spending their tax cuts and exporters who rushed to get their products delivered ahead of retaliatory tariffs. President Donald Trump told reporters at the White House that he was thrilled with what he called an “amazing” growth rate and said it wasn’t “a one-time shot.” However, private economists took issue with that forecast, saying the second quarter performance isn’t likely to last in the months ahead. In light of the report, have you seen significant changes in your finances within the last two years? Do you attribute these to the current administration’s economic policies? Do you see these changes as being temporary or sustainable? Call 866.893.5722. Steve Moore, former economic adviser on Donald Trump's campaign team and economist at the Heritage Foundation, a conservative think tank based in Washington D.C.